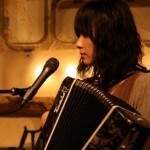 meso meso is a unique solo unit which features the sounds of the talented Yumiko. Creating music from various instruments including the guitar, piano, accordion and even toys. In 2008 she released her first album “mitten” with Lacies Records, a UK label founded by The Boats Andrew Hargreaves. She released first 2nd album (1st in Japan) “Yacca” via Inpartmaint Inc.
She is currently doing solo, trio and quintet show around the Tokyo area. Check her soon!